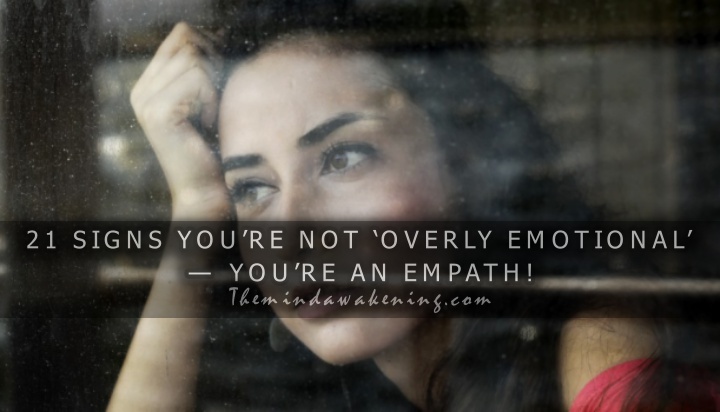 21 SIGNS YOU’RE NOT ‘OVERLY EMOTIONAL’ — YOU’RE AN EMPATH! 1. You feel helplessness when two friends need your help at the same time, or someone needs your help and you absolutely can’t. You want to help everyone. 2. People come to you—even people you don’t know super well—to talk about their problems and receive a shoulder to cry on. 3. And feeling very valuable that you were able to help. 4. You have a sixth sense about when something is wrong with someone, and you want to be able to immediately step in and help them feel better. 5. But you find yourself taking on other people’s pain, and burdening yourself with it. You can’t just listen to someone and nod along, you feel what they are feeling and carry it with you. 6. Sometimes you get overwhelmed when in a crowded public place such as a sporting event, huge party, or crowded bar. Oftentimes you prefer the company of a small, tight-knit group of friends who you know well. 7. People say that you are “soft” or “too emotional” for caring about everything. 8. And you’ve tried to care less, but you just can’t. You feel the weight of the world on your shoulders, and you are determined to make it a better place. 9. All this caring makes you extremely passionate about everything you do. You don’t waste your time “going through the motions” or doing something half-heartedly, you are here on this Earth to give 100% and you refuse to give any less. 10. Even when people judge you for caring so much and working so hard. 11. Your feelings do get easily hurt, because relationships are extremely important to you and words have so much power. You don’t understand how people just “brush things off.” How do they get by without caring?? 12. You find yourself needing a great deal of alone time to decompress and relax. 13. And you find nature to be an extremely relaxing and restorative place. Even a short hike through a park can leave you feeling refreshed and ready to go! 14. Oftentimes you become lost in your daydreams and fantasies, finding them to be a gentle place of escape from a mundane world. 15. You find it easy to express yourself creatively, such as acting, music, writing, or other arts. 16. Seeing violence and cruelty—even on television—is unsettling. Why do people have to behave this way? 17. You always look out for other people, and have a keen sense of right and wrong. You don’t tolerate people picking on the underdog. 18. You have an addictive personality, and can rapidly submerge yourself into certain activities or pursuits (even bad ones, sometimes, like excessive drinking). 19. The “truth” is something very important and tangible to you. You don’t want to be lied to, and you have a hunger to discover reality. 20. You don’t get along well with arrogant or conceited people. The world is a huge place, and we should all approach it with a sense of humility. 21. Negativity is only a fleeting thing for you. Tomorrow is always a new day, and you want to seize it.